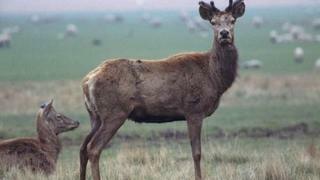 Two Durham Police firearms officers may face criminal charges after an injured deer was apparently killed with a crowbar. The officers had been dispatched to destroy the animal, which was believed to have been hit by a vehicle. But it is understood that, instead of using a firearm, the officers used a crowbar to kill the animal. The force's deputy chief constable, Michael Banks, said the Crown Prosecution Service had been informed. The officers, who have not been named or their ranks revealed, have been moved to other duties. Mr Banks said the deer should have been destroyed humanely with firearms, but had apparently been killed with a crowbar taken from a police vehicle. He said: "This should never have happened and I am sorry that Durham officers appear to have behaved in this way." The incident happened on 11 June, but was reported to senior staff by other officers two weeks later. Mr Banks said two officers responded to a call at Tanfield Lea near Stanley in the early hours and called for assistance to "humanely destroy" the deer. He said: "Two other officers with the skills and relevant equipment were despatched to deal with it. "There is currently an investigation under way because we do not believe the deer was killed in the humane way that it should have been. "Both [the officers involved] could face disciplinary action for gross misconduct and we are liaising with the Crown Prosecution Service to check about any criminal charges they wish to consider." It is not known which species of deer was involved, but the north of England is home to several, including Red, Roe and Fallow, according to the British Deer Society.